In order to somehow attempt to save myself from my ever-increasing backlog of places to visit I set out on Sunday afternoon to try a few new spots. 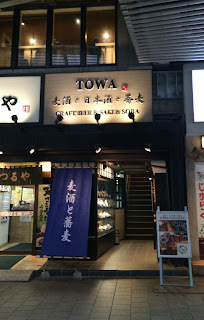 Towa was one of these spots. I don't often find myself in the Ueno area, but looking at the tokyobeerdrinker map it seems that this is an area that doesn't have many, if any entries, so I thought it would be a good place to get on here. 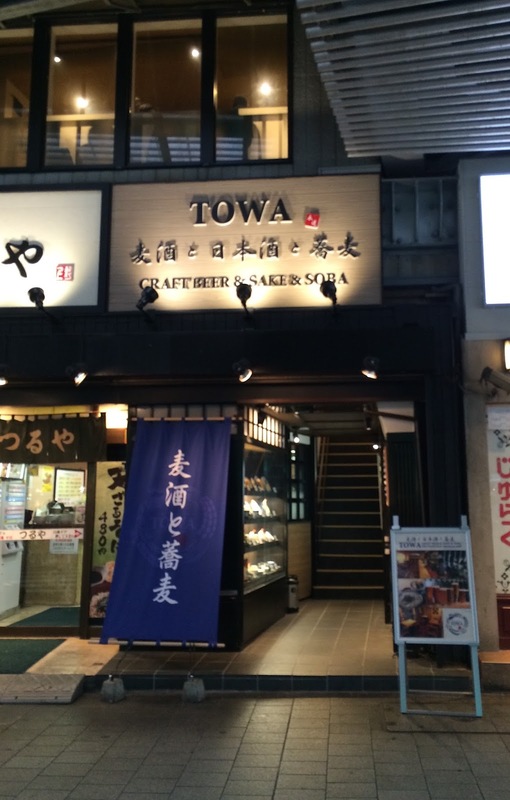 Towa is a craft beer and Soba place (once again, someone comes up with a combination that I don't think has been done before. Congratulations!) Sorry about the blurry photo, I took it whilst crossing the road as it seemed to be the only opportunity to get a clear (if a little blurry) shot. - Sleek looking place, with maybe more of a restaurant feel than a bar. Lots of wood and a surprising amount of seats for the small size of the place (eight at the counter and probably about 20-30 elsewhere). There is a smoking section upstairs and to be honest I wouldn't have noticed it unless I had read about it, which has to be a good thing. Quite like the under the train tracks location for some reason. - 15 taps, all of Japanese craft beer. Couple of hand pumps. Decent mix of breweries and styles on the day I was there. They have lots of branded glassware, which is a bit unusual for Japan. Big selection of Japanese brewery pint glasses above the bar and anything that they don't have a glass for comes in their own Towa glasses. Quite nice. Beers served in three sizes with all beers at the same prices. No sizes mentioned but I am guessing they are in the region of around 200ml, 300ml and US Pint. Prices are ¥770, ¥880 and ¥1150 respectively, so it's not a cheap place considering that all of these beers are domestic. They put their taplist on their facebook page, so you can check before you go. - Big pluses are that there is no cover charge (hooray!) and also that it is open during the daytime (hooray again! ), the latter being quite a rarity and perhaps explained by its proximity to Ueno station. Definitely worth popping in if you have some time to kill waiting for a train. - Run by the same people as the World End, an Irish pub on the same street that seems to have some craft beer too (seven taps according to the business card). They display their guest beer list outside so you don't have to go in to check, which was nice as there wasn't anything I fancied and I really needed to get a move on to the next place. I'm not putting it on here as the beer seemed to be slightly uninspiring US imports when I had a look, but if that's your thing (...), turn right coming out of Towa and it's on the right hand side a little after you come out from under the bridge. So, a fairly new place in a location that doesn't have a great deal of places in it, so it's definitely worth putting on here. Not sure how often I will be back as I am rarely in the area. Like the fact that it dedicates itself to Japanese craft, but it probably is a little too pricey for me to make the trip across Tokyo to. This one is pretty easy. Leave Ueno JR station by the Shinobazu exit. Cross the road. You're there. Thank you. This was the venue whose name I could not remember, but seemed to understand it was affiliated with The World End irish pub. I was in World End for a brief time because it opened at 16:00. I was intent on getting to Beer Club Popeye by 17:00 [via J.R. trains]. Were I to move to Tokyo and opt to open a bar, I think I would select a neighborhood on the east side, like Ueno or Asakusa, rather than the busy, busy west side.